This article appeared on 16 December 2013 in the print and on-line versions of Manila Bulletin's "Angels Talk" under the by-line of Dang U. Koe, ASP Chair Emeritus. GMA-7’s “24 Oras” reported Gene and Rita Managbanag who were helping others in Ormoc City at the height of super-typhoon Yolanda. Rita, a Special Education head, handled the evacuation of residents in her school while Gene was busy relaying messages to the rescue team as a radio communicator during calamities. They didn’t know that in the act of saving others, they would lose one of their own. What the news did not say was that the Managbanag couple are the founding leaders of Autism Society Philippines’ Ormoc District 1 Chapter, and that the eight-year old Lorenzo was their son who drove them to pioneer autism advocacy in Ormoc. During the 2012 National Autism Conference on “Living with Autism,” disaster preparedness was discussed by parent panelists who shared their experiences with their children with autism during super typhoons. One of them told a heart-breaking story about a mother who made the painful choice of leaving behind an adult daughter with autism who resisted being pulled out of their home filled up with floodwaters. The mother had to save the other family members. The daughter drowned. But even the tips shared by the disaster expert during the conference could not have prepared any family for Typhoon Yolanda, as experienced by Dr. Geraldine Abuyador, founding president of ASP Tacloban chapter. Her son with autism Marky, 10, was not mindful of the rains in the beginning. His family went their usual way having already secured their house from the storm. Then as water rose fast, Marky was carried piggy back by his yaya to go up their second floor. He was crying as they waded through the dirty seawater inside the house. He only stopped crying and screaming when his yaya brought him to the window and explained to him that his swing could not be seen because of water everywhere. But maybe for other children with autism, having no sense of danger is a blessing. There was no trace of any fear on the face of seven-year-old Marc Laurey even when all his family members were already crying as they were being terrorized by Yolanda’s wrath. According to his mother Pia Chu, ASP Ormoc District 2 president, Marc’s first super typhoon experience made him more aware of his surroundings and taught him about stormy weather. After Yolanda, Marc also learned how to mingle with their neighbors because he enjoys going with his mother to relief distributions. The other best thing that he learned because of Yolanda is that he now knows how to lead the rosary! Dr. Abuyador also could not stop counting her blessings after Yolanda – the people who helped them migrate to Davao, including those who gave Marky free therapy sessions as they adjust to their new home. “Mas nagsasalita na si Marky ngayon. We hear him say words he has not said before. Who knows if the trauma of the experience allowed his brain to use nerve connections or pathways not used before?” says Dr. Abuyador who could only thank God again and again. Picking up the pieces of their lives, these brave and resilient families still have one thing in common – the need to pursue autism advocacy after Yolanda. The loss of their dear Enzo made Gene and Rita Managbanag vow to pursue the advocacy even more relentlessly for “we cannot let the memory of Enzo just fade away.” While still busy overseeing the needs of the evacuees, the power couple behind ASP Ormoc District 1 has started planning for Angels Walk for Autism next January in their city. For the sake of their children, Lee Mercado’s family has moved on to Manila, leaving behind their home and properties. She immediately contacted ASP national office to inquire where to place her son with autism and how to keep the child busy while looking for a school. Kind-hearted centers offered free therapy sessions for them and their other Tacloban chapter members who relocated to Manila. As chapter leader, Lee continues to monitor her flock and guide them in finding help. She appeals for temporary therapy centers so that children with autism in Tacloban will not regress. 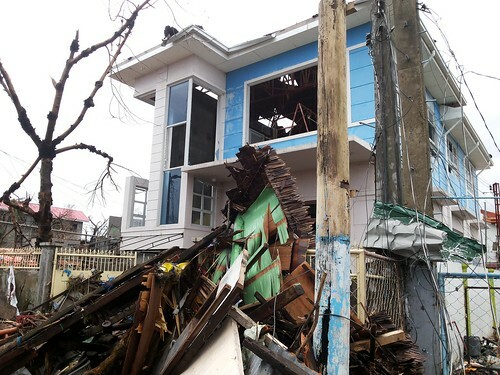 Pia Chu’s family home, though flooded, was spared by Yolanda. She immersed in relief and rebuild operations by being a volunteer for various civic and volunteer organizations such as Rotary and UK Shelter for Humanity. Pia is now appealing for help to rebuild Linao Central School which housed the SpEd Center where her child with autism used to go. When Dr. Abuyador’s family left Tacloban to settle in Davao City, she felt hopeless to reopen the school she built as a personal mission – the Tacloban Center for Autism and Other Developmental Disabilities. But when she called up a parent to inform him that she would refund the tuition fee paid for his son with autism, the father asked her where would his son go if TCADD would close. “Then I remembered, TCADD is not my school but His school and He will provide for our needs.” Her teachers said they would stay in Tacloban and re-open the school even without salaries! They unanimously agreed to give free SpEd services in Tacloban City. For those who would like to help in rebuilding therapy centers for children with autism and other special needs in areas affected by Yolanda, please email autismphils@gmail.com. (Green turns silver as ASP celebrates its 25th year in 2014. Part of the celebration is the Angels Walk, also the annual kick-off event for the 18th National Autism Consciousness Week which will be held on Jan. 19, 2014 at the Mall of Asia Arena in Pasay City. Sign up on-line at http://bit.ly/angelswalk2014, for your free tickets.